The Super Eagles are in a good mental and physical shape for tomorrow’s match against Croatia, Coach Gernot Rohr said yesterday. Nigeria’s match against Croatia tomorrow is one of the two Group D clashes, as Argentina and Iceland play the other game. “We are looking forward to the match with a lot of optimism. It will be a tough one, but we are physically and mentally ready. We had quality preparatory matches and trained twice at our final camp in Austria, and since arriving in Essentuki, we have done some useful tactical preparation. 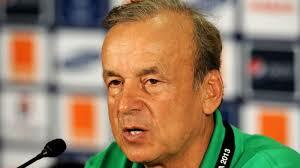 It is important to start well in a good tournament like this, and that is what we hope to do on on Saturday,” Rohr said.